The ascent to the Passo Falzàrego from Caprile is quite boring. The Falzàrego is much less interesting than the Passo di Giau, which, just like the Falzàrego, connects Caprile with Cortina d'Ampezzo. The road of the southern ascent is wide, is more busy than the road to the Giau, offers relatively few views and is nowhere really steep. The steepest kilometer has a slope of only 7.7% and is found immediately after the start in Caprile. After that, the next nine kilometers, up to where one gets to road SR48 in Cernadoi, are easy with a slope between 2 and 8%. Sometimes there are nice views of the Sella Group (left front), of the Marmolada (on the left) and of Monte Civetta (on the back). 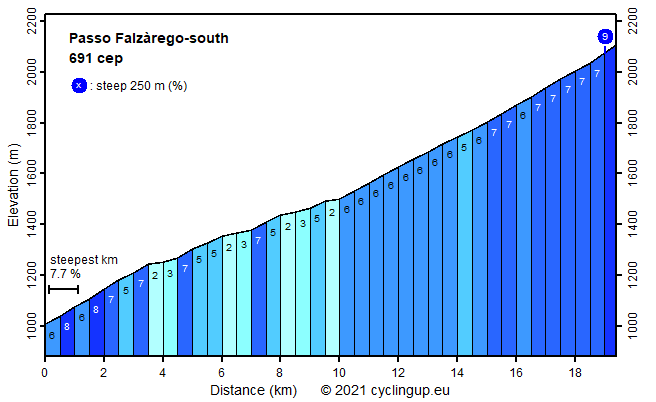 The remaining ten kilometers from Cernadoi to the pass may almost all be cycled with the same gear because the inclination is almost everywhere 6-7%.